Challenger Lifts 12001 Symmetric 2-post car lift w/ single point air lock release & 1′ extension (14′ 8″ ht.). Single point air actuated lock release allows technician to disengage both columns simultaneously. Standard combination stack screw pads and storage brackets accommodates a wide range of vehicle pick up points. Oversized steel pulley reduces stress on equalization system and provides increased durability. Padded overhead shut off system prevents vehicle damage from being raised too high. 60″ lifting carriage lessens column stress by dispersing load. Whether you want to expand your fleet service capabilities, avoid downtime or just increase your bottom line, Challenger Lifts 12,000 lb. 2 post car lifts are the best solution for your servicing needs. Not only does our 12000 Heavy-Duty truck lift hoist a lot, it’s a lot of lift. 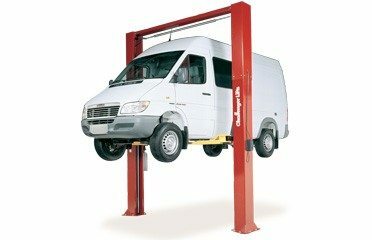 The 12000 series heavy duty two post car lift has features that you would expect to pay more for, like low profile arms, padded overhead cut-off bar, adapter accessories, and column height extension lifts for higher profile vehicles. In fact, no other car lift company gives you more.